Business lockout service and commercial lockout assistance are available through our professional commercial locksmiths. Commercial lock and key experts in Easton, Allentown, and Bethlehem PA are one phone call away to help you with any type of commercial lockout service. We’re working 24 hour a day, providing emergency locksmith services to residents of the Lehigh Valley, PA.
Perhaps you wonder how long time it takes to unlock your office? We can unlock almost any commercial door in approximately 15-30 minutes. Wherever your business is in the Lehigh Valley, we can be there with you within 20 minutes. 24-7 commercial locksmith Easton PA is the fastest way to get you back on making money. We know that while you’re locked out of your business, you can’t make money. Therefore, we guarantee to be there soon after you call us. LockTech24/7 Locksmiths, high trained professionals that can assess any locks and commercial door. We offer a variety of commercial lockout services, whether you’re locked out of your office or storefront door. A business lockout can be a little bit tricky, especially when you have a panic bar on the other side of your door. Yet, When you are locked out of your office there is no reason to break a window. Neither to ruin your day’s work. Your best decision is to contact an experienced commercial locksmith to unlock your door and solve the problem with ease and efficiency. We are Lehigh Valley professional mobile commercial locksmiths. So don’t look furthermore and call us for fast emergency lockout service. Our commercial locksmith ready to assist you day or night, not to mention we can unlock any door. We can pick almost any commercial lock in your office, don’t hesitate to call us now. How unlucky someone can be to get locked out of his business? All business owners wait for the next day to open their business in order to make money. When you love your job, you make your office your second home. 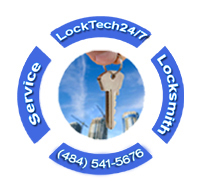 Se we are at LockTech24/7, we love doing locksmithing, helping our customers. It doesn’t matter if your business is in an industrial building or an office, our locksmiths uses several different methods to unlock your office’s door and be cautious to leave your office unharmed in the process. Most locks, including commercial locks, work of pins system. Therefore, we can usually pick almost every lock. Dealing with licensed mobile commercial locksmiths will also give you peace in mind in the long run. Fast Locksmith Service – We offer 20 minutes response of any office lockout or commercial lockout situation. We can be there tight now, helping you with any commercial lockout needs. 24 Hour Emergency Locksmith Service – We’re available 24/7 to help you with any lock out incident in your office. No matter what kind of door you may need to unlock in your business. Be that as we may say, it can also be file cabinet or safe lockout. We Are Local Locksmiths – We are local locksmiths in the Lehigh Valley, PA. Whether you’re in Easton, Bethlehem, or Allentown, we can help you in no time. Warranty & Support – We offer 90 days warranty on products and labor, as well as full customer support. Professional Locksmiths – You can rest assure that every work we do in your office, it will be done in 100% , not to mention with attention to details.